ADI is continuing to alert cinema goers across Europe of the suffering of Vana Mana the elephant who features in ‘The 100 Year Old Man’ movie directed by Felix Herngren which is released in both Latvia and Lithuania on September 19th. When the film was released in the UK recently, the Huffington Post featured the following statement from the filmmakers "...we can confirm that the elephant was not mistreated or harmed in any way during the making of the film. At no stage during the filming process did the production have any reason to question the Cirkus Scott’s recommendation to use this particular elephant or the trainer." Although this may have been the case, sadly it was a very different story for Vana Mana off-set and behind the scenes. 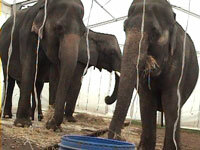 Whilst with the Great British Circus in the UK, ADI exposed how Vana Mana and her companions Sonja and Delhi were beaten and chained for long periods by both her trainer Lars Hölscher and groom. The act left the country after one season but Vana Mana and Sonja – Delhi, who was chronically lame, has sadly since died – continue to tour with their trainer across Europe, most recently in Latvia where performances at Riga Circus have been met with protests. Lars Hölscher has used different names for both himself and his elephants. In Riga Circus, the elephants were renamed to Sabu and Burma, and their trainer assumed the name Lars Selesa. In Sweden last year, Vana Mana and Sonja were renamed Ghandi and Baby whilst at Cirkus Scott. The news of their suffering hit the media and soon after Cirkus Scott announced that it would stop using wild animals. The 100 Year Old Man bills itself as a comedy, but there is nothing funny about the shocking abuse of poor Vana Mana and other animals who suffer in the name of entertainment.